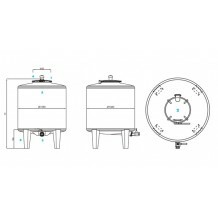 MTL 1000 Litre Stainless Steel Vessel with central total drain & welded legs. The bottom has a deep drawn shaped discharge to grant full product discharge. Stainless Steel cold rolled AISI 304 (316 on request). External satin polished, internal BA Polished. With cold-forged bottom cover with optimised shape, minimum thickness of 2 mm. This tank also comes in volumes starting from 545 litre up to 1533 litre. Call us for a quote. Robotised TIG welding process. Pickled and passivated seams. Bath galvanised, stainless steel palletised base (painted on request). Stainless steel ring welded to the tank and screwed to the base. On request: available in steel inox AISI304.